Rail users in and around Philadelphia can shop while they wait for their train after Ahold-owned online grocer Peapod become the latest retailer to target commuters with a virtual shop. Peapod has launched poster advertising on the city's Titan transport network that it hopes will encourage commuters to buy groceries as they travel to work. By scanning the QR code on the ad, commuters can access the Peapod app and then scan the bar codes on the poster to buy products. The app also allows users to browse "thousands" of other items, the retailer said. Companies like Grupo Bimbo, Procter & Gamble and The Coca-Cola Co. have "partnered" with Peapod "to reach on-the-go consumers in this convenient, innovative way", it added. 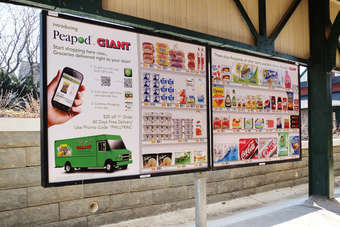 "We want to make it easier to grocery shop anywhere any time, even while waiting for the train," Peapod COO Mike Brennan said. "We chose Philadelphia to launch this initiative because it's a new and exciting market for us. Titan had the most compelling media property in the city and it just made sense for us to let commuters know about our free, convenient application." Last year, Tesco launched a similar initiative in Seoul, where it put up virtual store shelves on the walls of subway stations in the South Korean capital. The moves add weight to the claims that consumers are ready to use smart phones to buy groceries. There are obstacles to convincing consumers to shop on their phone, with consumers concerned, for example, they are missing out on offers in stores. Nevertheless, the number of people shopping with their smart phones is increasing, opening up new ways for manufacturers and retailers to attract consumers.